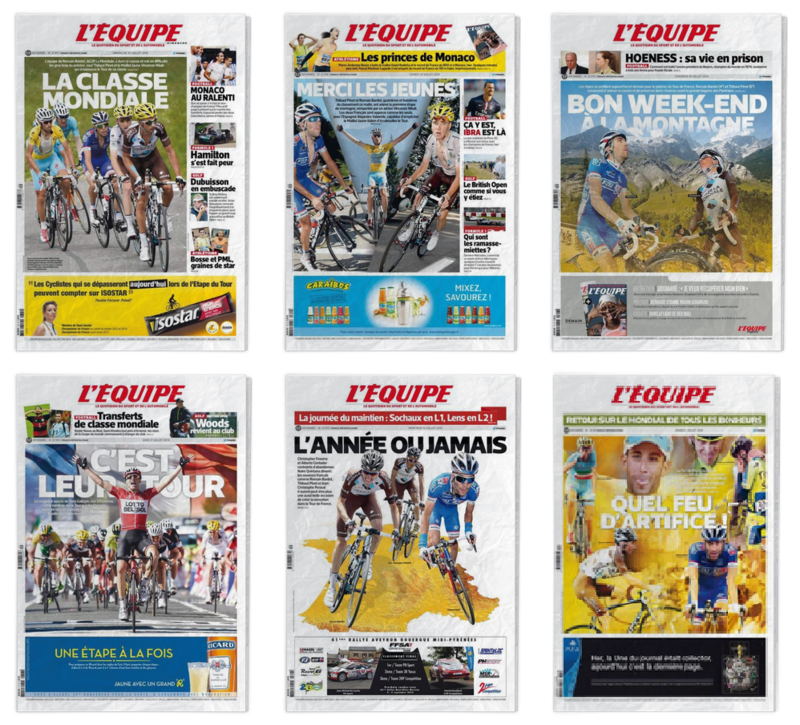 How was last summer’s Tour de France for you? Chances are the response varies by nationality. It was supreme for many Italians and fantastique for the French with successes, drama and the crowning triumph of two compatriots on the Champs Elysées podium. This book uses the Tour de France’s summer limelight as means to profile Jean-Christophe Péraud, Romain Bardet and Thibaut Pinot. It’s not the story of their race but a fuller biography where at times the Tour is almost forgotten. It’s in French but worth sharing with readers of this blog for the insights. Many will have seen the trio on television and perhaps heard their voices for the first time during the Tour de France’s television coverage or seen them on the front page of L’Equipe last July. Only rather than recounting the race stage by stage Pierre Carrey has done plenty of research, interviews and even dug up family photos to compile this book about three riders, it’s the story of their (cycling) lives so far rather than who-did-what in between Leeds and Paris. All three riders are interviewed in detail while friends, family, team mates, managers and others have also been interviewed to build up detailed profiles. At times it’s almost an uncomfortable read because the analysis extends well beyond the sporting sphere and into private life. It’s not invasive as Carrey does not pry, rather the trio and their entourage open up to reveal so much more than we normally get, from practical jokes to private thoughts and things like family life. It’s the level of detail that fascinates. Peers, colleagues, coaches and others are interviewed and anecdotes told. It’s story-telling as opposed to a list of their results in the U23 and Junior ranks. Some will say Jean-Christophe Péraud only got on the Tour podium because others crashed out, fair enough although he was one of the few who could follow Vincenzo Nibali uphill. An accidental podium? Perhaps but it doesn’t make Péraud’s story any less interesting, the background to how he got to Paris is fascinating given his unconventional career. On the bike he seems tense: perched forward on the saddle, back arched and his face wrinkled like a Shar Pei. But the book explores the other side, a relaxed family man who grew up in a household that didn’t have much of a competitive streak, his mother isn’t even interested in the Tour de France: ride but why race? 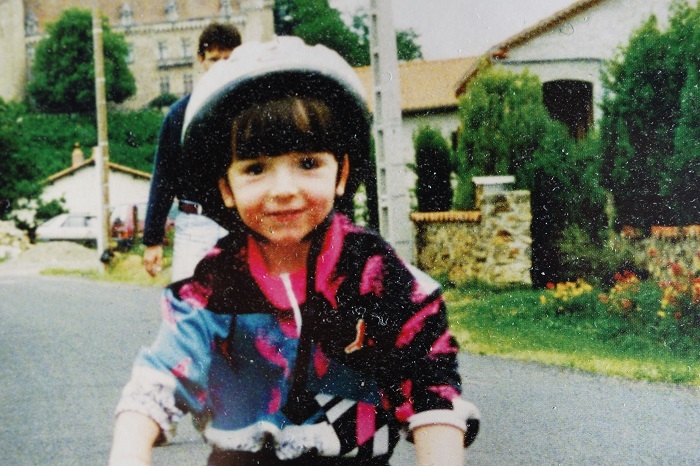 When Péraud first tried but failed to land a pro contract with a road team his father suggests he stops cycling and starts working. It’s a portrait of modesty and normality, work brings rewards but even when he bought an Aston Martin last month it’s a second-hand model that’s eight years old. Romain Bardet rides for Ag2r La Mondiale with Vincent Lavenu as his boss. 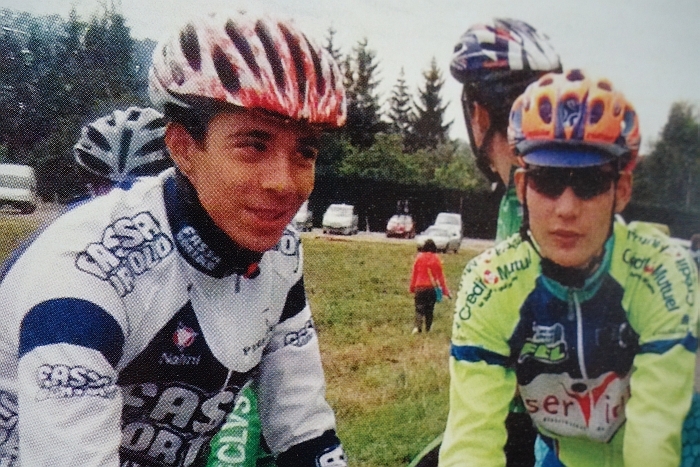 It turns out he and his dad got a ticket to ride in a team car for the Clasica San Sebastian only he was 11 at the time and while his dad rode with the Alessio team, upon seeing the small kid all the managers and mechanics said no. Except for Vincent Lavenu. An anecdote? Yes but it just part of Bardet’s story and there’s more on his background, his studies and mental approach. Sometimes labelled “the student” because he’s doing a Masters degree – he sat an oral exam by phone from the team hotel during the Ardennes campaign – or even portrayed as an intello because of his expanded vocabulary, the book presents someone combining theory and practice, yes he’ll travel with economics textbooks or sports science tomes but when it comes to training he’s a worker, the Stakhanovite who’ll do six hours in rain if needed. Bardet cites Descartes as he reveals he unconsciously refused to believe he could get on the podium last summer. There’s also an exploration of Bardet’s struggles with food and weight, the borderline between a strict diet and an eating disorder, plus his “théorie des bières” where one beer to celebrate is ok but those who start to have more, more often, are no longer 100% professional. The term anarchist appears several times in the chapters on Thibaut Pinot. At times he’s a joker, testing the patience of others with elaborate stunts and amusing tricks. You’ll have to buy the book to read about the secret cell that goes by the name of Team Frottman or the story of hacking other people’s phones for comic effect. But there’s a serious side, he buys an SRM as a junior and others consistently praise his work ethic. Among the photos is one of him in a vegetable plot, swapping carbon forks for the cast iron gardening variety while still sporting FDJ cycling socks: here’s the connection to the land, a timeless image of French cycling. Pinot at times resembles a modern Charly Gaul and the lonely legend of climbers, happy in his own company or quietly fishing with a few close friends. The big drawback for some readers is the language as it’s in French. But this blog is read in francophone countries and many of you will understand some French too. Because of the focus on riders, the clear prose and the volume of pictures it’s approachable for those with rusty Français. Just as David Moncoutié’s “Ma Liberté de Rouler” autobiography was reviewed it is a pleasure to share this too. Whilst the English language publishing industry pumps out many biographies things are different in France. Moncoutié’s book is a rare example of a rider biography and he’d retired before it came out; Laurent Fignon’s book appeared shortly before his death. If we exclude Richard Virenque’s semi-fictional account and we might have to go back to decades to find a book about active riders, perhaps Bernard Hinault? Unlike a lot of French publishing which can be austere with plain covers Nouveau Cycle is full of photos on glossy paper as hopefully you can see above and below in this review. This deserves a big audience in France, an introduction to the three riders to the general public for those curious to know more and essential for any cycling fans. It’s readable and well-written, the prose has that sometimes poetic style found in French sports reporting (the parting words on Péraud describe him as “the minuscule man, flattened by the weather, beaten by deluges and slopes worthy of Golgotha”) and is all the better for it. Enjoyable and informative, Nouveau Cycle is highly recommended for any fan of French cycling on the condition they’re happy with the French language too. It might be three Frenchman but Carrey has picked the suggestive title (“New Cycle”) to illustrate riders who oppose what he labels “chemical and inflationary cycling”. The stories are engaging, candid and if readers are hooked in by the trio’s performances from the Tour de France they’ll finish the book thinking of three humans, the race becomes almost incidental. The triple-format means each rider’s whole life story is not covered. At roughly 50 pages per rider including many photos it’s rather like three very long magazine features rather than three biographies listing every up and down. And perhaps it’s all the better for it because the trio have plenty left to say in the coming years. 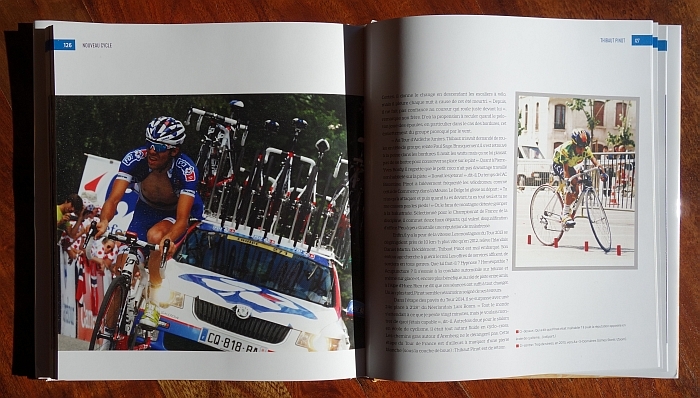 It’s available in French bookshops or can be ordered online at directvelo.com for €22. Thanks! Was debating with myself about reading it, because of the “it’s in french” part. Now the debate is over, will read it in any case. Can’t read more than ten words of French, such a shame. Thanks at least for this thoughtful review. Too bad Pierre Rolland is not included. That’s the power of the Tour, here are riders reflected in its limelight. 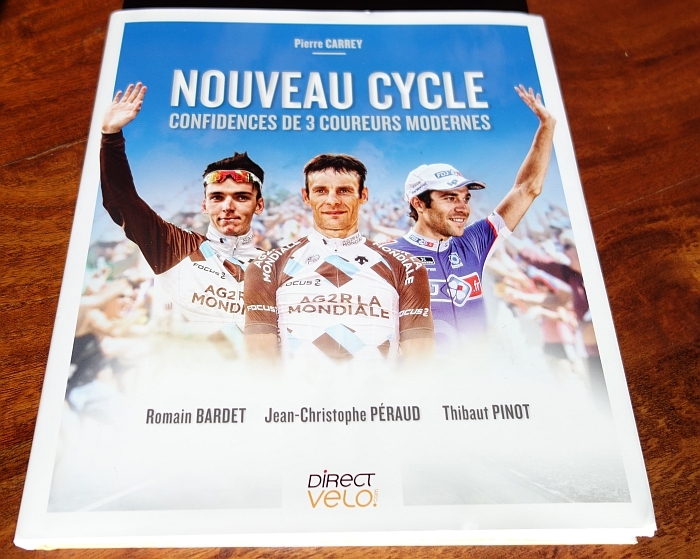 There’s room for another book with Rolland, Bouhanni, Démare, Gallopin, Coquard and more on the condition that they become more well known among the French public in order for this book to sell beyond the cycling circles. And the format would work well of course with others too. Little is known about Alberto Contador’s youth etc. Many thanks for the ‘heads up’. Not always easy to spot French publications. Although they are neither written in French nor authored by Frenchman, there have been several Anglo Saxon publications featuring French riders. “Slaying the Badger’ by Richard Moore comes to mind. Riders aside, one of the funniest books a cyclist could ever read is by another Moore, Tim and his ‘French Revolutions’. Tim Moore did a tour of Italy this year recreating the 1914 Giro. If you liked French Revolutions you’ll find Gironimo is full of similar observations and jokes. With all the English-speaking MAMILs out there, we can hope the thing might be translated? You are cruel – LOL ! Sounds a great read. Unfortunately my French is worse than rusty, and I don’t think my more linguisticly skilled wife would agree to translate it for me. How interesting. Both the heads up on Peraud and the somewhat different voice of INRNG in 2010. I’m interested to follow Péraud in 2015, he had a great season in 2014 and not just the Tour, a strong Tour of the Basque Country and winning the Criterium International. Very interesting. Unfortunately, these three guys – excellent as they are – all seem to come from the type of traditional, “deepest France” background which fewer and fewer of my (French) students would relate to – especially the ones under 30. They’d need a book on Bouhanni. And for that Bouhanni needs to win plenty in July. Vicious circle? I say ‘unfortunately’ just for the future of cycling as a national sport in France. Agree that 2015 will be interesting to see what Peraud targets. Is it better for him, at his age (assuming he doesn’t improve further) to challenge for the win elsewhere, or be 5th in TdF?